All across the Marlborough Downs one can find Stone Age monuments. At their centre stands Avebury, a village with a pub, the epicentre of the crop circle phenomena, 27 large standing stones (originally there may have been 90-100 stones) quartered by two busy roads! It is the largest megalithic stone circle in the world. The village was built around the site in the Middle Ages. In the 17th century antiquarians John Aubrey and William Stukeley took an interest in Avebury before the destruction of the 17th and 18th centuries when stones were broken up to build local houses. Again, measurement is crucial to our understanding of this site. John Michell regarded Avebury as ‘the central sanctuary of ancient British priesthood.’ Michell thought Avebury was certain to figure in the process of awakening Albion, whom he took to be the soul of Britain’s land and people. 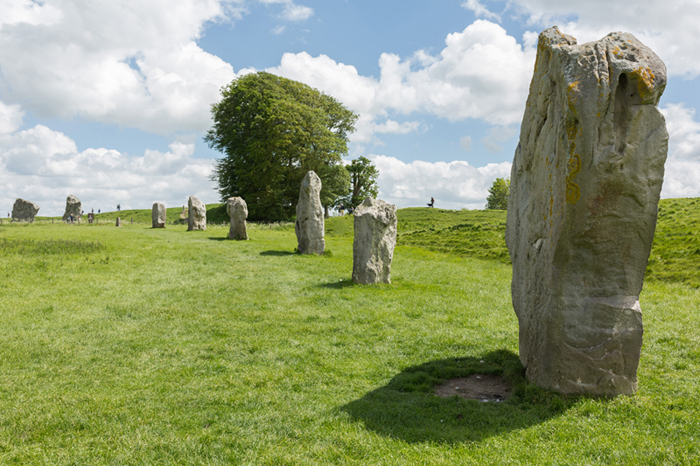 By studying its measurements Avebury certainly demonstrates its leading role as Britain’s ‘national sanctuary,’ and can be seen as important to the larger Earth grid of Planet Earth. Even in the 6th century Gildas wrote that ‘Britain is poised in the divine (so it is said) which sustains the whole Earth.’ Michell believed in Blake’s prophecy that a prime place of revelation would be at Avebury. Recent research has shown the hidden depths of some of the stones leading to estimates that some of the stones may weigh more than 100 tons. Nicholas Mann published his interesting contemporary findings in ‘Avebury Cosmos: The Neolithic World of Avebury henge’ (O Books 2011) which merges facts with a measured visioning and is an important aid to understanding this most impressive site.